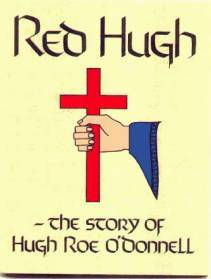 A 40-page biography of Hugh Roe O'Donnell (1572-1602), last of the Gaelic kings of Ireland. Well-researched and written from original sources, including the Annals of the Four Masters, Lughaidh Ó Clerigh, and Red Hugh's confessor Father Donagh Mooney. Illustrations include Simancas Castle and Red Hugh's letter to King Philip of Spain. The cover is heavy gold parchment printed in four colors. A new copy, published in 1985 by the Aodh Ruadh Ó Domhnaill Guild. To order the book from Valkyrie Publications, go to our Contact and Orders page.